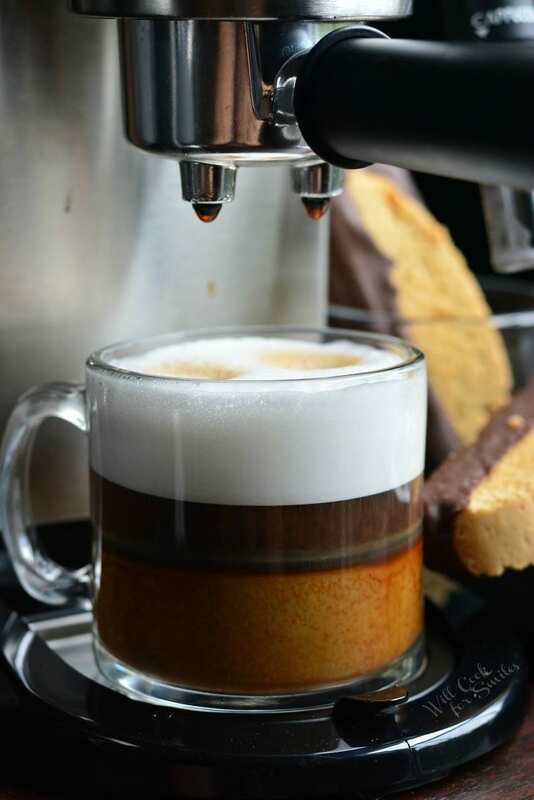 The best start of the day is a perfect cup of coffee and a tasty Cappuccino Biscotti next to it. 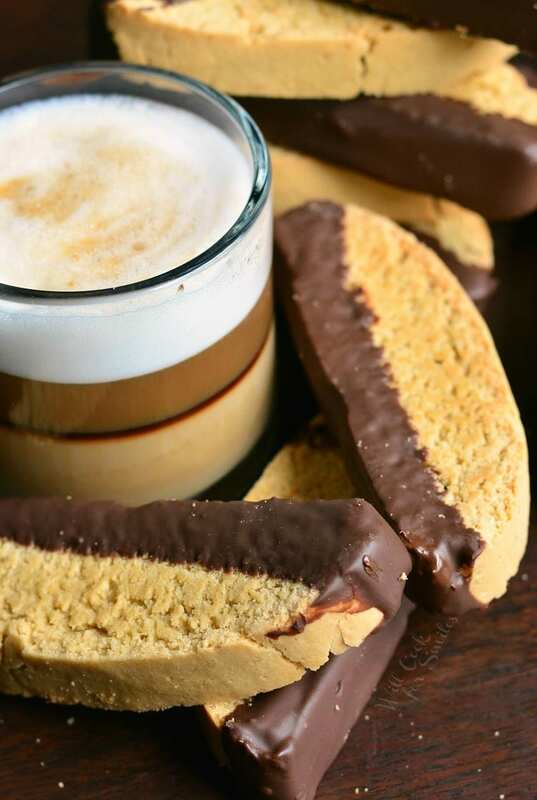 Crunchy dark chocolate dipped Cappuccino Biscotti is a cookie worth waking up for and perfect for dunking into a hot cup of coffee. I send this text message to my husband so often, I have it saved as a template on my phone. Yes, I love coffee and I can’t live without it. South American, African, Arabian, Espresso, French Roast, or Vienna, yes, I will take them all and preferably in an IV. I’m just kidding, I have my favorite blend for espresso and for coffee. I love Espresso Bel Canto and make a special trip to Whole Foods to get the beans every week. My day instantly gets better once I get a cappuccino in my hand. This kind of coffee love is true but it comes with a price. It can get quite expensive to get a cappuccino at a coffee shop every day. This year, Santa got me the best present! Santa sent me an espresso machine and a grinder and I felt like a kid on Christmas morning opening my new toys. The box may have said De’Longhi but I know it was Santa because this De’Longhi Dedica DeLuxe Manual Espresso Machine is a perfect gift. And, the Dedica Stainless Steel Conical Burr Grinder is an absolute perfect addition to make the best cup of cappuccino. I called him back in two minutes. It may look complicated with all the knobs and buttons, but it’s really easy to figure out and use. Instructions as very clear and easy to follow pictures and one time is all it takes to learn how to operate this beauty and there are actually only 3 buttons and two knobs. (It looks scarier when you first open it.) I can have a perfect cup of cappuccino in less than 5 minutes. If you think about it, not having to get dressed, drive to a coffee shop, stand in a long line, and wait to get your coffee is quite a perk. I can have any type of coffee drink at home, in five minutes, and I can wear my pajamas. As a matter of fact, anyone can have their own perfect cup of coffee drink at home within minutes, just the way they want it. 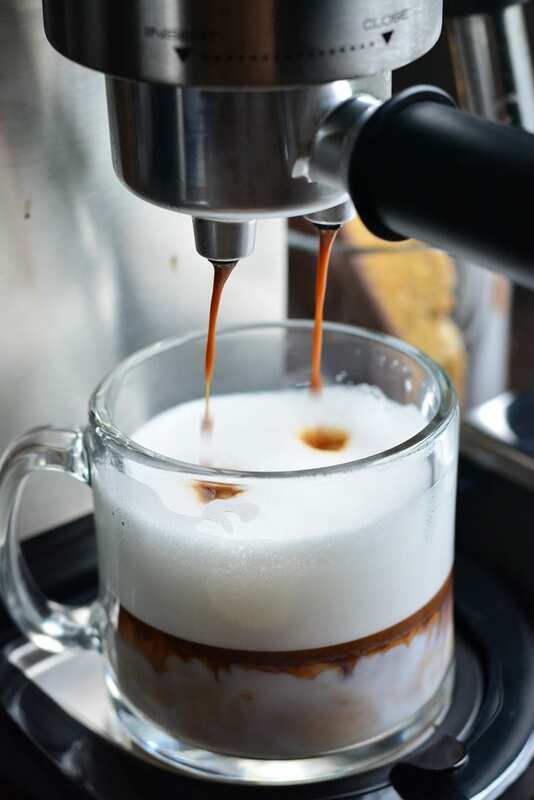 To that I say, “HA, bologna!” At home, I’ve steamed non-fat milk on many occasions and I’ve even put this espresso machine to the test and steamed almond milk and soy milk, producing a nice amount of froth for my cappuccino. 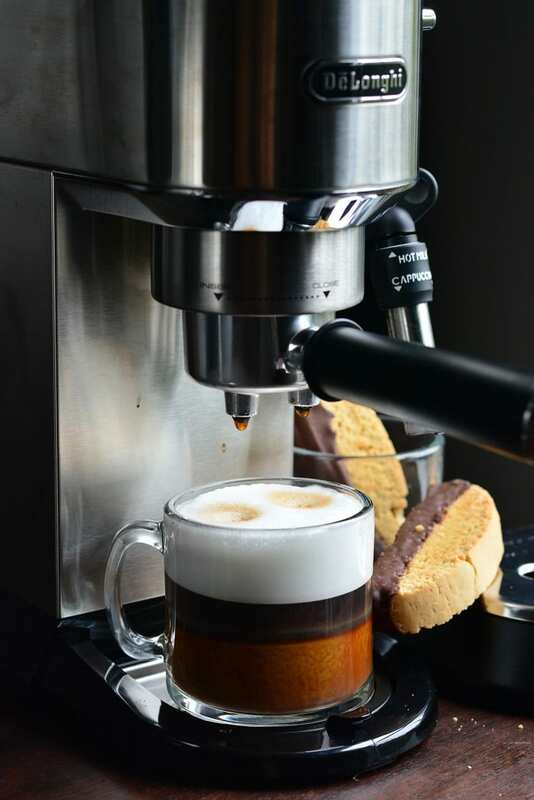 So no more dirty looks from baristas, we can have a beautiful cup of cappuccino at home just the way we like it! The only thing I needed was some biscotti to go with my cappuccino. 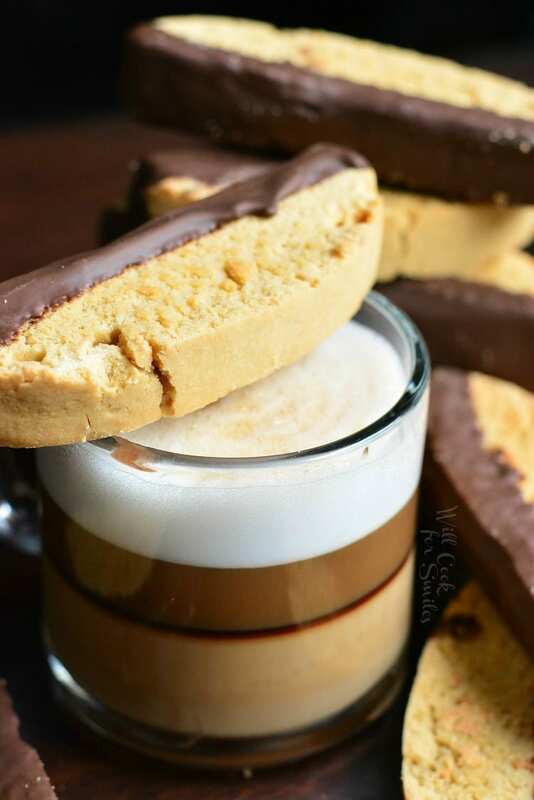 It’s too bad that a cappuccino make can’t make me some biscotti as well. ~ REALLY fast warm up time. I love how fast it warms up because while my husband waits on his coffee maker to warm up, I already have a cappuccino ready. ~ I can use an E.S.E. Pod or my own coffee grounds. 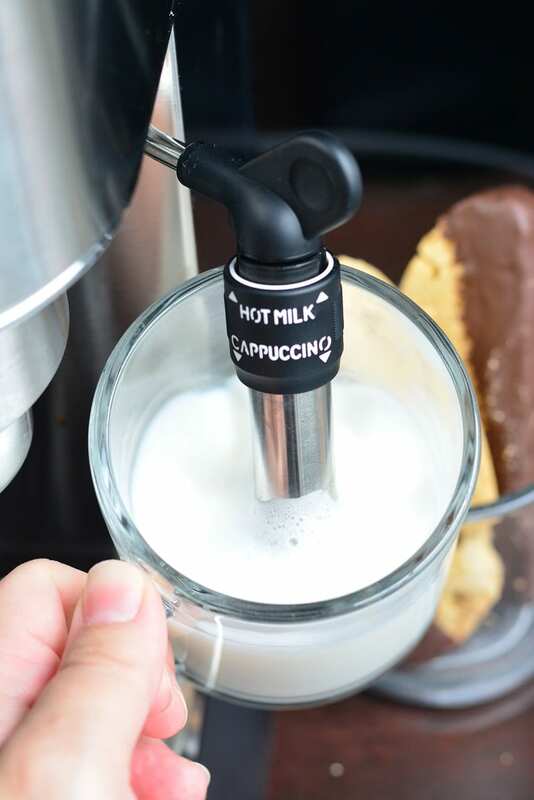 ~ It has a Double Drip Tray, which is a two-level cup holder to use on taller cups. ~ I love that it’s slim and small. It’s not bulky so it fits into a small space. ~And again, it’s awesome how easy this machine is to use. 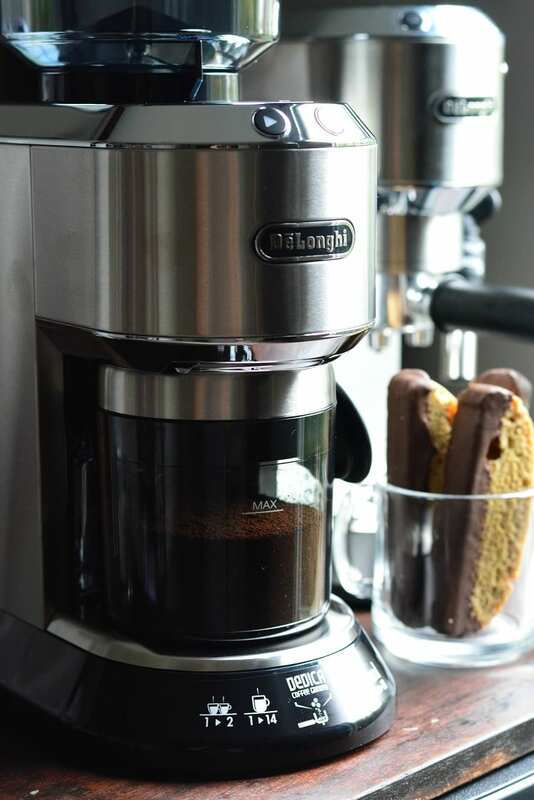 It’s a dream gift for every coffee lover and pairs perfectly with the coffee grinder. After all, freshness of the coffee grounds is important to the best tasting coffee. That’s why I love the feature of being able to grind a single serving for one cup. It also comes with the storage container to keep the ground coffee fresh. 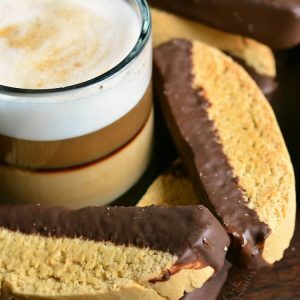 Since the machine that makes a cappuccino AND a biscotti for me hasn’t been invented yet, I guess I have to make my own biscotti. Biscotti are twice baked, crispy cookies. 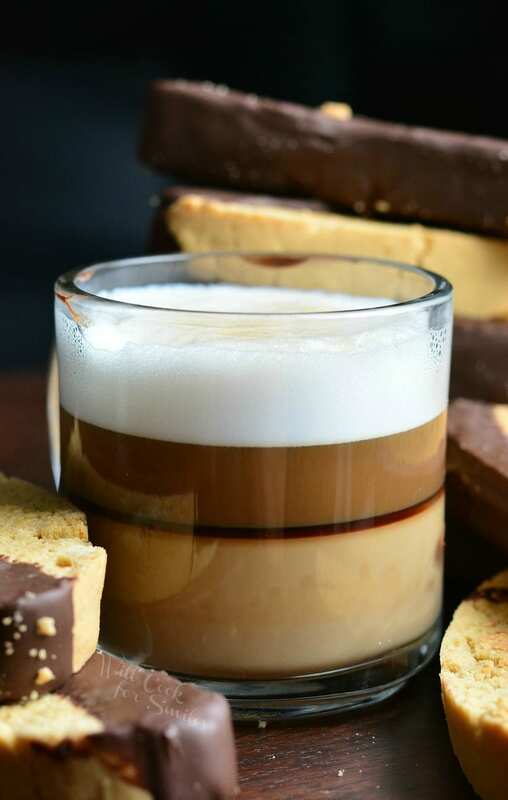 Many different flavors can be added to biscotti but a combination of chocolate and cappuccino is my favorite. I also like to bake it a little bit less the second time so the cookies are not as crunchy. Although, it’s a personal preference and doesn’t affect the delicious taste. 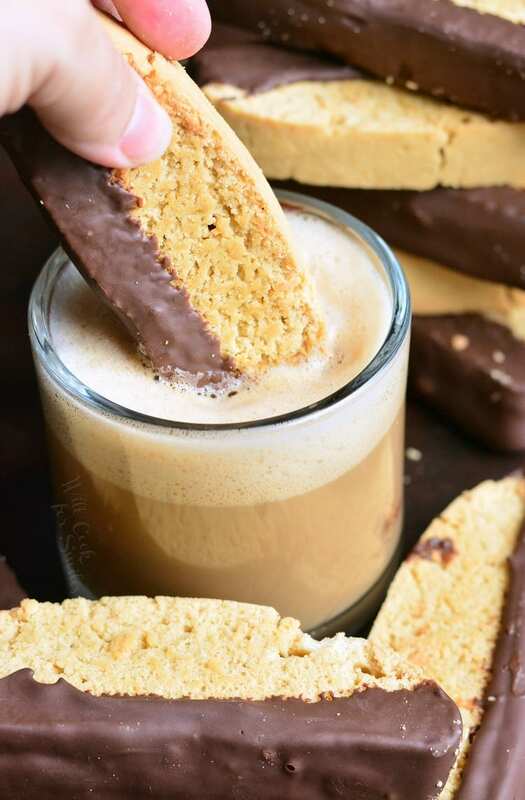 Crunchy dark chocolate dipped Cappuccino Biscotti is a cookie worth waking up for and perfect for dunking into a hot cup of coffee. Prepare espresso and let it cool down. Preheat the oven to 325 and line a large baking sheet with parchment paper. In a large bowl, whisk together eggs, oil, vanilla extract, and espresso until smooth. Add flour and baking powder and start whisking until it becomes too thick. You can either use a rubber spatula or your hands to finish mixing the ingredients. The dough will be thick but still sticky. Grease your hands with a little bit of oil so the dough doesn't stick to your hands and it's easier to handle. Separate the dough, place them on the prepared baking sheet in two and form each piece into a roll that's a little less than an inch thick and about 4 inches wide. Leave a little space between the logs. Bake for about 30 minutes. Take out of the oven and immediately cut the loaves into about 1/2 inch thick slices with a serrated knife. Let biscotti cool completely before dipping in chocolate. Melt dark chocolate wafers in the microwave or in a double boiler. Dip each biscotti bottom in chocolate and place the biscotti back on the baking sheet upside-down (chocolate covered bottom will be up) so that it solidifies evenly. Placing it upside down is not necessary but it looks nice. Chocolate biscoottis would make a really nice Xmas gift!